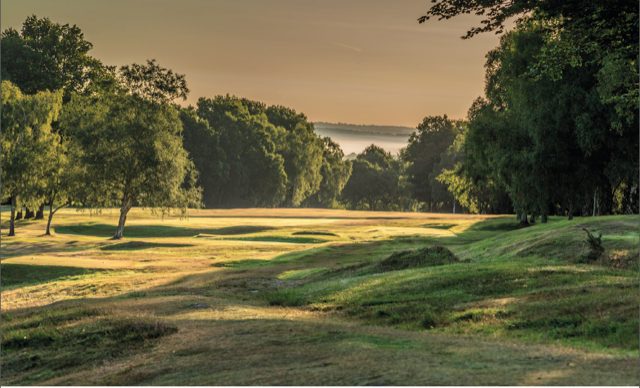 Societies looking for a memorable golfing challenge in serene surroundings will be hard pushed to beat the historic experience of playing Royal Ashdown Forest Golf Club’s West Course in leafy East Sussex. Located in the heart of the protected Royal Ashdown Forest, the sister club to Royal Ashdown’s Old Course presents a unique golfing experience. Voted the ‘Best Course in the UK under 6,000 yards’ by Golf World, the 5,606-yard West will certainly test all elements of your game. A feature of the stunning par-68 layout is the complete absence of bunkers, but the lack of traps doesn’t mean you can leave your sand wedge behind, as numerous streams, grassy pits, run-offs and wicked undulations provide plenty of opportunity to show your skills with your more lofted clubs. With only one par five – the 500-yard third hole – and eight par fours measuring under 360 yards, it is finding the fairway off the tee, and staying on the small, but often severely sloping greens, that will place the most pressure on your game, while the lengthy par threes – including the 240-yard 11th – will also test your long-iron play. After your round, guests can enjoy the excellent clubhouse facilities, with modern changing facilities on the ground floor, while upstairs the comfortable bar and restaurant occupies a light and airy space and serves a great selection of home-cooked food. With the capacity to cater for up to 80 people, and an outside terrace overlooking the course, it’s a great place for hosting societies and corporate outings. bacon roll and 18 holes.